The Floor is Lava is a game that most people have played as children and I am no exception to that. Clambering over the living room furniture trying to get to the dining room table without touching the floor was fun, despite the wailing from my parents at my siblings and me, thanks to the chaos we were causing. So entrenched is this game in people's memories it's somewhat surprising to find that it has taken this long to make a video game about it. As that is exactly what Hot Lava is about, jumping over pools of hot lava in various environments to escape unscathed without touching the floor. There's no story to Hot Lava: it's just you reliving your childhood glory days of clambering over furniture to get to some other part of a room with touching the floor. The major difference here is that in Hot Lava the floor is actually lava so touching it is indeed fatal. Various items are floating about in it, most of which should be burnt to a crisp but hey, this is video games right? Who cares about flammable materials when you're here to have fun! The booth for Hot Lava at PAX West 2017 was really popular and it took me a little while to get some time with it. When I did I understood why it was drawing so many people in; jumping from one piece of furniture to another across an ocean of lava was oddly satisfying and there is a great sense of accomplishment as you make that last jump to land slap bang in the middle of a filing cabinet and then leap off it to safety, just as it sinks into the molten rock. This is very much parkour at its very best! 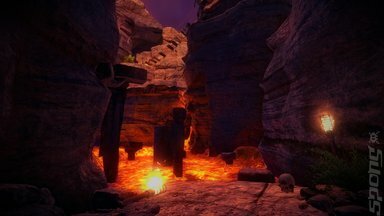 A quick glance at the screen shots will show you that Hot Lava is viewed from a first person perspective and will cause some to shudder at the concept of jumping using such a view. I too had some issues with that as I have some very bad memories of playing Turok on the N64 with its propensity to have players jump between small platforms in first-person view. Thankfully things have moved on since Turok, with Klei Entertainment using a clever visual aid to indicate when an object is beneath them as they sail through the air. A reticule in the middle of the view has an arrow pointing down as the player passes over an object and also there is some control mid air that helps when leaping from one precarious and temporarily stable platform to another. 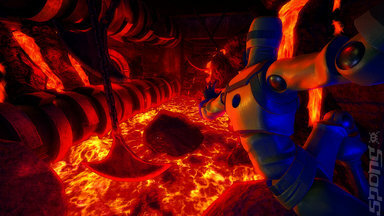 With Hot Lava being filled with molten rock everything does have an orange glow to it. However, Klei Entertainment has inserted items with deeply contrasting colours to aid navigation through levels, which is a wise decision otherwise Hot Lava would be little more than a scene awash with lava. The tapestry of sound used in Hot Lava does a great job of enhancing the feeling that the room you are in is indeed filled with extremely hot rock and the score maintains the sense of urgency that you really need to get out of there as quickly as you can. 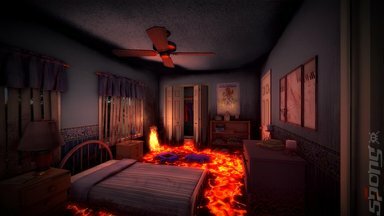 Hot Lava is due out sometime in 2018 on Windows PC.